This view shows Neptune with four of its satellites in the foreground: from left to right, Despina, Galatea, Proteus, and Larissa. The view is from a point 5,200 km from Proteus. Field of view is 35°. The map of Neptune is from James Hastings-Trew. The model of Proteus is modified from that at Philip J. Stooke's web site. 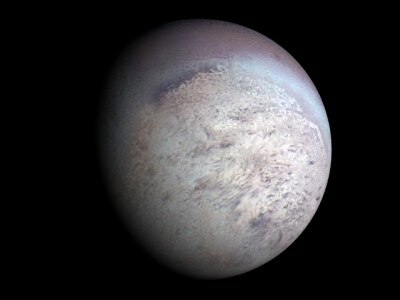 This view of Triton is from 6,200 km above its surface. It shows most of the southern portion of the Neptune-facing hemisphere. The Triton map is modified from a map by A. Tayfun Oner found at a mirror site of Views of the Solar System. 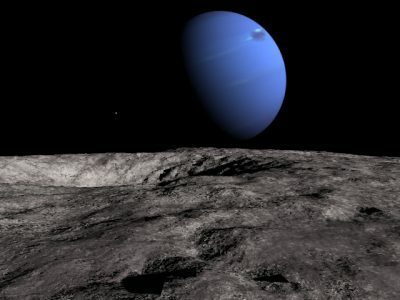 This is a view from near the south pole of Proteus, looking towards Neptune. 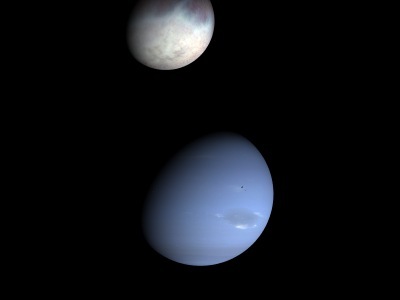 Triton is visible at the left. Field of view is 70°. The map of Neptune is from James Hastings-Trew. The surface of Proteus in the foreground was rendered with Terragen. This view of Neptune and Triton is from 29,000 km above Triton. 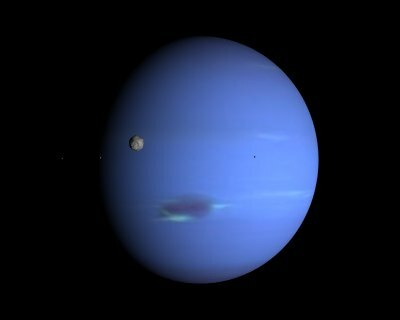 Proteus is also visible in front of Neptune. Field of view is 20°. The map of Neptune (with more realistic color) is from Björn Jónsson's web site. The Triton map is the same one used above.